The Youth Department of Northeastern Mindanao Mission is requesting all CAYO Officers, Youth Organization Officers by Chapters, District Youth Presidents, Mas-Amicus Officers by Chapters, Single Professionals Officers, Rescue Officers and AY Leaders to attend the 7-in-1 Assembly Meeting this coming February 6, 2016 at Northeastern Mindanao Mission (NEMM) Headquarters. Please don’t miss this event. I am looking forward to meeting you this coming February 6, 2016. The Northeastern Mindanao Mission (NEMM) that oversee the Seventh-day Adventist Church in Caraga Region will hold a massive Church Officers Orientation into six (6) different areas of Caraga Region this coming January 22-23, 2016. This orientation is a program conducted by the Administrators, Directors and Staff of the NEMM to the Church Officers of the Seventh-day Adventists. The lecturers are divided into six groups that will visit six venues starting January 23, 2016 and January 30, 2016. The lecturers will include Duties and Responsibilities of each of the officers elected by the church to ensure that the newly elected officers will have the full knowledge and will function in line with the mission and vision of the church. These are the speakers/lecturers by group. Pr. Eugenio R. Cubelo Jr. These are tentative schedules, for more information you may contact your district pastor/leader or any of the administrators and staff of Northeastern Mindanao Mission. The Women’s department of South Philippine Union Conference (Mindanao) will hold the Women’s and Pink Ministries Convention with the theme “Be Beautiful for God” at Mountain View College, Valencia City, Bukidnon, this coming October 21-24, 2015. The guest speakers are Mary Jean Loreche, MD, pathologist, TV Host and Producer at Hope Channel, Arceli H. Rosario, PhD, Program Director for PhD at Adventist International Institute of Adventist Studies, Pleny R. Camagay, BSE, MCLA a former Women’s Ministries Director at SPUC, and Alevir P. Pido, CPA, MBA, the Vice President for Academic Affairs at South Philippine Adventist College. Mrs. Merna E. Pamunag – the director of the Women’s ministries department are encouraging every women to join the convention. The purpose of this convention is to empower women to nurture and reach out to the community by putting Jesus first. There is a registration of P380.00 for the official delegates and P180.00 for non-official delegates. For more information please contact your district pastor/leader or the Women’s Ministries Director for Northeastern Mindanao Mission. “Bible study and baptism are not the end of our labor but the beginning of discipleship and nurturing says Pr. Bernabe M. Dahunan, the director of the Sabbath School and Personal Ministries Department of the Adventists in Caraga Region. Our training to the leaders of the church will continue in helping the newly baptized adventists to be a matured Christian. The Office of the Sabbath School and Personal Ministries department in connection with the Discipleship and Nurturing Department is conducting a series of workshops here at Caraga Region. Pr. Bernabe M. Dahunan emphasized the importance of discipleship and nurturing program. It aims to develop matured Christians that would spread the gospel message not only in words but also in action. We are blest to have Pastor Rogelio Nomus – the director of the Discipleship and Nurturing Department as our guest lecturer/speaker on this workshop. The intention is to provide workshops to four strategic areas to encourage the churches in Caraga to send their delegates. These are the four strategic places, the date and the participating districts. “I am inviting the church elders, care group leaders, laymen and personal ministries leader to join the workshop,” said Pr. Dahunan. The delegates must prepare Php100.00 to avail the workshop materials. For more information contact your district leaders/pastors or your church elders. The Movement of Adventist Students (MAS) will hold a convention this coming October 18 – 20. 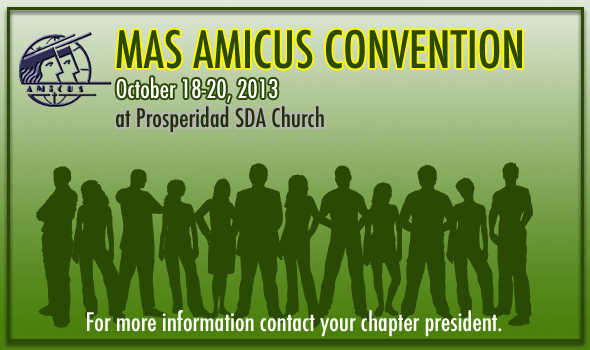 This convention is hosted by MAS Amicus PNU-Chapter. The location will be at the Prosperidad Seventh-day Adventist Church, Prosperidad, Agusan del Sur. Divine Worship: Pastor Heshbon Buscato, Youth Director, South Philippine Union Conference. For more information contact your Chapter President.